1. Steam eggs in a vegetable steamer 16 minutes; cool slightly, and peel. Slice eggs in half lengthwise, and remove yolks; mash yolks. 2. Stir green onions, mayonnaise, yogurt, Dijon mustard, black pepper, salt, and chopped cocktail onions into yolks. 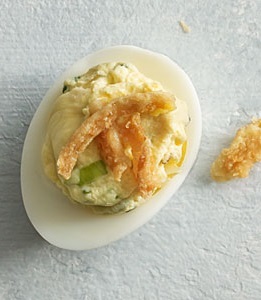 Divide among whites; top evenly with French-fried onions.